Summer may be very distinctly over in areas like northern Minnesota where they're expecting four inches of snow this week. But there are plenty of places where a hot fudge sundae still sounds good this late in the year. Dairy Queen has an offer that will help you savor the sun's last gasp before winter truly settles in to ruin your good time. In the restaurant's mobile app, you'll find a buy-one-get-one-free (BOGO) deal on small sundaes right now. It's pretty straightforward. Buy one at menu price, and you'll get the second gratis. To take advantage of the BOGO offer, open the app and look in the "deals" tab through October 14, when the free sundaes will take their leave of us. (The last day of the deal is National Dessert Day!) Participating DQs will allow you to redeem the offer, but those locations, unfortunately, do not include any Dairy Queens in Canada or Texas. 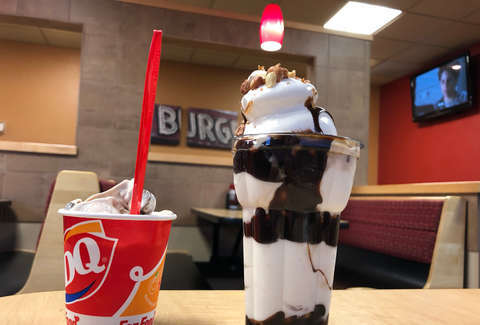 If it's you've never downloaded the DQ app before, you may want to plan a couple of stops over the next week. When you sign up for the first time, you'll have a totally free Blizzard loaded into your account automatically. The coupon is valid for a full week after you download the app. Get on it quick before the snow flies.